Review #1. This article is not sponsored. I have been waiting for such a camera for a long time..
– silent mode function, for taking intimate photographs in all those situations where photographing is not much welcome . – but what is the most important – the camera has an excellent quality 35 mm lens, the lens that was used most extensively to take the pictures in the whole 180-years long history of photography, or actually – not pictures but the real photographs, images with the unique value, those that will last for years staying in the memories of everyone, not just the photographers. A legendary 35mm lens allows to see slightly more that a natural view angle by human, without any deformations. And such a lens makes us approach the subject very closely: two up to five meters, to get an intimate, credible and emotional photo. For the last few years such a camera has bee to our disposal, now in two versions: Sony RX1, and Sony RX1R2. Both versions have a fixed 35mm lens, made specially for Sony by Zeiss, one of the best optical manufacturers. The lens is of an outstanding quality, and belong to a very limited number of the lenses constructed specifically for a digital photography – exposing the light on the sensor in a parallel way. It counts particularly when photographing with small number of aperture set on the lens. A leaf shutter allows to synchronize the flesh with any speed. Additionally it makes it more difficult to shoot blurred photos while photographing with slow speed. This is a very handy and useful feature. 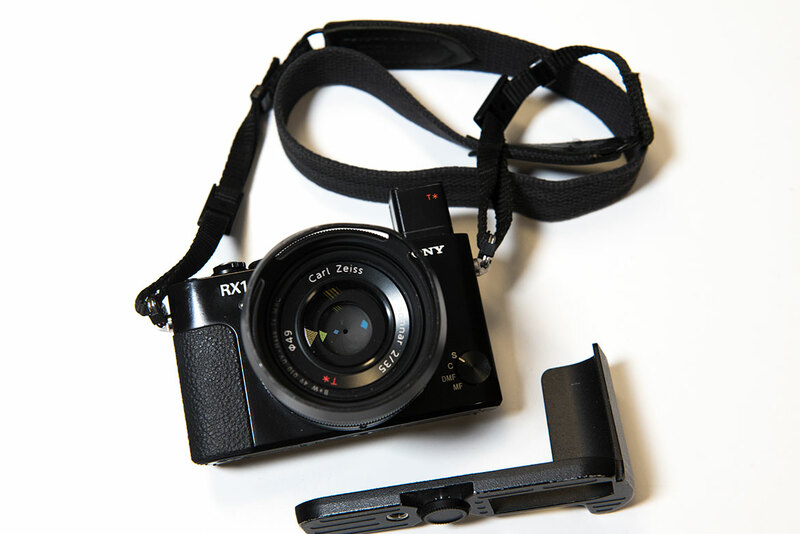 RX1 is probably the only camera available with a leaf shutter built in the lens. I have been using the camera for quite some time and I haven’t found any cons which I could responsibly write about, here. Save for the price – this is still quite high. One thing to consider if you are interested in the gear is the choice between version one and version two of the camera. An EVF in version two that replaced a small flash in version one is the fundamental difference. When photographing with version one I successfully used an angle viewfinder which I mounted on the flash mount lifting it up so that my RX1 resembled in use an old Rollei Flex – you see the image in the viewfinder looking at it from the top. Such a pose has one strange vice. Quite often a person being photographed does not realize that he or she is being photographed at the moment. The person thinks that the photog is rather busy with some other activities like checking out the pictures taken before or some other things on the screen. But if a photographed person notices that the photo is being taken – it often leads to a barrier being risen, questions being asked. it seems to be a much more serious invasion into privacy of a photographed person than if a photograph simply holds the camera directly by an eye. This strange circumstance not only is a result of my practical experiences. It quite often appears as an observation in aa outstanding movie about an American photographer Vivian Mayer who herself took photos with Rollei Flex looking through its “chimney”. As I mentioned earlier the version one has a small built in flash unit. I used it very often as an unnoticeable fill in flash for deep shadows, when taking contrasty portraits from a short distance. The flash is not very powerful and rather should not be used as the main source for the light. It proves to be very useful as a fill in flash and during the night street photography. In those cases a slight extra light from the flash reveals an extra sharpness feeling, opens up smoky shadows, creates that three-dimensional feeling. The second version does not have a flash. It was replaced by a collapsible =, convenient and a quality viewfinder. So that you do not have to mount anything more, carry anything more, remember about anything else. In a small bag there is a ready to use camera which is capable to cope with most of the challenges that a professional photographer can encounter. This version is the very one that I carry with me all the time. I shot numerous photos based on emotions, in innermost situations, presenting my objects from a small distance. Very often, when lifting this camera up to my eye I have a feeling that I do not cause any fear. It is the contrary. I can feel a compassion, a sort of. A compassion that this is a man who did not succeed in his life. Who does not even have a mobile phone with him, who tries to photograph with this unserious toy-like camera. Such a toy cannot harm anyone, can it? I use this phenomenon – I approach people, smile, and press the release button silently. I also recommend a small TTL flash, HVK-F20M. It will help us with filling up the deep shadows with the light, as well as during the night photography, as I wrote earlier. We definitely will not be able to every type of photography with the RX1. It is not suited to photograph wildlife of Africa, for instance. But who needs ever more pictures of such scenes. Still, we have the whole bunch of great photogs, including my colleagues from the National Geographic Magazine – France Latin and Michael Nichols. We shall never beat those guys – their files are “completed”. Let us see their photographs and enjoy them. And enjoy that there are so talented folks among us. In my opinion – it is sufficient, although I am not quite sure about it. However – I certainly do recommend that Sony RX1MII camera to all of you who are interested in a photography of “real” people. People who do real things. The photography based on capturing life in its privileged, exceptional and authentic moments.